Miles Davis – trumpet, keyboards; Adam Holzman – keyboards; Neil Larson – keyboards; Wayne Linsey – keyboards; Steve Reid – Percussion; Glen Burris – Sax; Vince Wilburn Jr – Drums; Ledisi – vocals. Record Store Day 2018 sees the release of a 12” EP from the lost ’85 Miles Davis Rubberband recordings. It’s great to hear this hidden gem from a really interesting point in Miles’ late-period recordings. 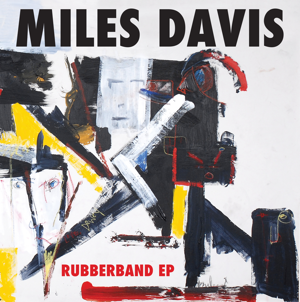 Made in 1985 as part of a series of Rubberband sessions, it was subsequently abandoned by Miles as he moved on to record the critically acclaimed Tutu album – an album that saved his reputation after a series of disappointing albums in the early 80s. Although Miles’ later recordings are often regarded as less virtuosic than his early recordings, there’s still much to admire in this EP. The EP itself contains the original recording of Rubberband as the final track. It also includes 3 new versions of the track made by the original producers Hall and Giles, 32 years later. The new sessions have a far more laid-back, trip-hop feel to the original. The vibe reminds me of the Mo’ Wax recordings of the 90s. They feature guest vocalist Ledisi, who does a great, soulful job, complementing Miles’ muted playing perfectly. The original is very different in style. Brash and thumping with a huge synth bass and drum loop, it sounds very of its time. The full-on synth assault reminded me of an old Jan Hammer theme, but I’ve since read that the producers were aiming for a sound like Cameo (a popular synth-funk group of the time). The two disparate sessions won’t appeal to everyone because of their chiming differences, but I really enjoyed them both. For a fan of Miles, it’s great to hear the artist at an important period of change in his artistry. Also worth checking out is Miles’ collaboration with Prince – made in the same year. It was originally intended for Tutu, but again, abandoned by Miles. The 12” record will be available on the 21st April and the sleeve features artwork by Miles himself.